Pele vs Maradona Comparison - Who Was Better Player ? Pele vs Maradona Compared – Who Was Better Footballer ? One question which divide football fans since Maradona was at his peak, Who was the better footballer between Maradona and Pele ? it splits opinion among football fans and since Messi and Ronaldo are tearing teams apart you people are throwing their name in greatest football player discussion. But today we are going to take a look at Pele and Maradona’s careers and try to pass a judgment on who was better and why ? 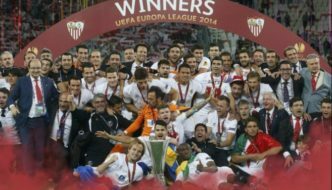 We will take into account several factors like medals and honours, goals and level of competitive football. But lets first take a look at their short career summaries and bios. Special Abilities: Pele was blessed with superb tactical awarness and vision from a very young age and he went on to become a very lethal striker with his excellent finishing ability. He was equally good with ball at either foot, very good in air and was blessed with lightning speed and pace and combine it with a very level head on his shoulders as he rarely lost control of his emotions even when constantly tackled throughout games. Pele seemed to be on top of his game throughout the career his level of performances never went down. Special Abilities: Maradona is widely regarded as the greatest dribbled of all times and he was mainly a left footed player (a lethal one to say the least) but the greatest atrribute was his ability on inspire his team and Argentinas 1986 world cup success and Napoli winning Italian league and Europa Cup was highlight of his inspirational performances and the most important thing was the bigger the stage the better his performances were. Maradona also had a peach of a freekick and scored some beauties from dead ball situations. Pele claims that he scored 1281 goals in 1363 games but we all know that their is great uncertainty about the numbers so we are only going to take into account his official career record compared with Diego Maradonas. Pele played 669 official games for Santos, New York and his national team Brazil and scored around 626 goals with goal to game ratio of 0.96 which is far better than Maradona who played around 492 official games in 3 different leagues and scored 258 goals with goal to game ratio of just 0.52. Pele played in Brazil and USA where the football was not as competitive as compared to big European leagues where Maradona scored way less goals than Pele but made bigger impact. Although on international stage Pele scored 77 goals for Brazil in 92 matches of which 12 goals came in world cups. While Maradona scored 34 international goals in 91 matches and he only scored 8 in world cups. But goal record is not enough to judge a players ability specially when we are talking about two greatest footballers the world has seen. 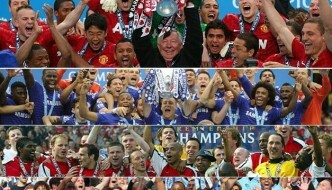 When it comes to players career success it alot goes down to the fact how many titles he won with his teams and than his individual success. For a footballer of course the ultimate prize is winning the FIFA World Cup and Pele achieved it three time with his native Brazil side while Diego Maradona won it in 1986 (pretty much single handedly). 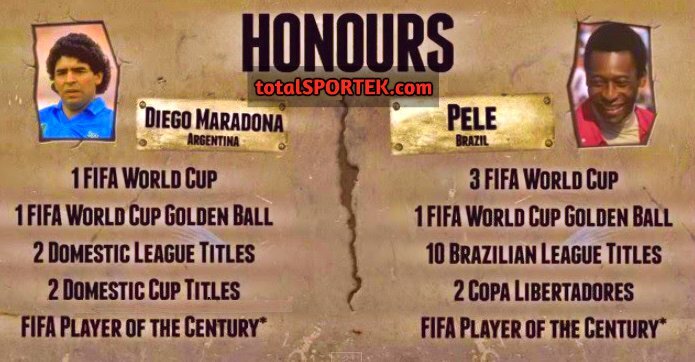 Here is a list of major honours won by both Maradon and Pele. Pele won three world cups and his first triumph came in 1958 at the age of just 17 years where was regarded as the next wonder kid but did not influence much on the teams success. Had a decent 1962 world cup and guided Brazil to world cup win against in 1970 where he was part of the greatest football team of all times. As far as his club football was concerned he played most of his career in native Brazil with Santos winning 10 league titles before moving to New York to play in the MLS. Maradona on the other hand inspired a very average Argentina side to world cup glory in 1986 scoring two of the greatest goals in world cup history, first was against England in quarter finals where he dribbled from his own half beating several players before putting the ball in the back of the net (this goal was regarded as the “Goal of the century” by FIFA and later he scored another similar goal against Belgium. He played for Barcelona for couple of seasons before moving to Napoli in Italy where he won Italian league title with a very average Napoli side and also guided them to UEFA cup victory. Greatest moments of both Maradona and Pele’s career which included world cup triumphs, guiding their teams to league titles and winning individual honours. So its pretty obvios that Maradona made bigger impact on the team he played for and also spent most of his career playing in more competitive leagues in Spain and Italy compared to Peles Brazil and USA. One could also argue that Brazil would have won the 1958 and 1970 world cups with or without pele but Argentina most probably wont do it withoug Maradona in 1986. Verdict: Considering what they have achieved in their careers its hard to judge who was better on top of that they played in different eras and totally different countries. 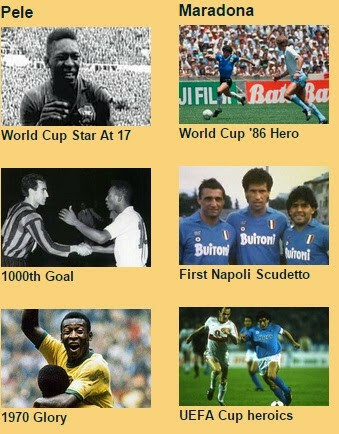 Pele was absolute beast of a finisher and there is no doubt he would have been a success in competitive european leagues had he played there but Maradona did play in Spain and Italy and his success with very average Napoli side stands out. So for me Diego Maradons ability to influence big games and inspire his team mates is what wins the battle for him against Pele. But I would like to know what you think of this discussion ? 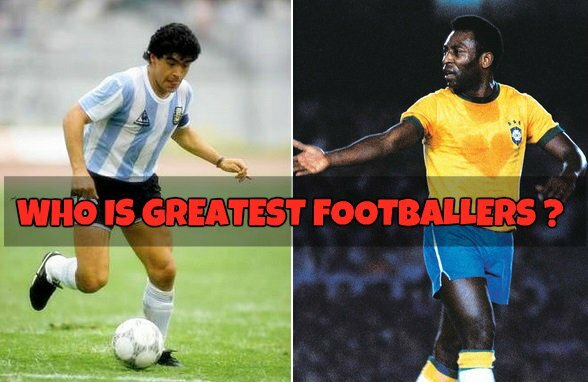 do you agree that Maradona was better footballer than Pele ? or is the other way around ? let me know your thoughts in the comments box below. Maradona at the peak of his game, would definitely beat Pele. He was just out of the world. On the ball, he was the best thing that this world has ever seen – technique, speed, power, imagination, movement – you name it. Yes, Consistency wise Pele might be the greatest that world has ever seen. But if we compare the best games between the two players where they have played at their peak, Maradona will be a sheer winner. 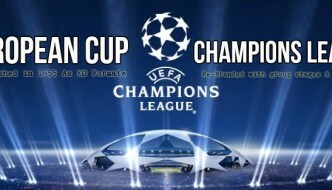 In my opinion, in born talent and class is simply something one cannot ignore. Which ever era, they would have played, they would have dominated the game for sure. I don’t agree because Pele has agility,speed and his deadly finishing. 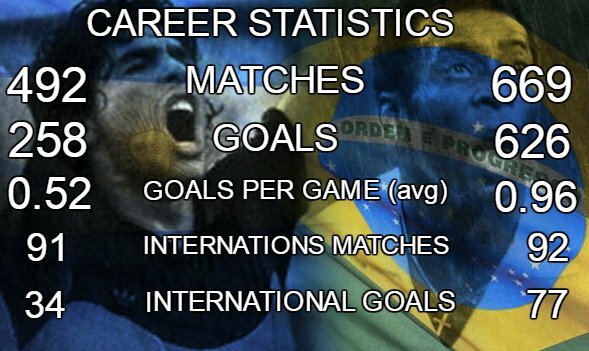 Pele scored way more goals than maradona and played more matches as well. 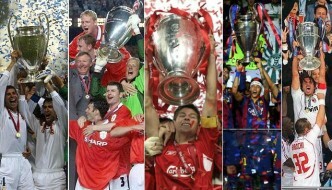 Pele is the king of football. I am inspired by him.